Girouard argues that there’s currently a “misallocation of capital in our economy” — the fact that large companies spend lots of money to recruit and hire college graduates, yet given their lack of traditional credit history, the graduates themselves “couldn’t raise $30,000 if their life depended on it.” Usually, of course, their life doesn’t depend on it, but that kind of money could help people pursue their big ambitions and dreams, rather than settling for a corporate job that they’re not that excited about. 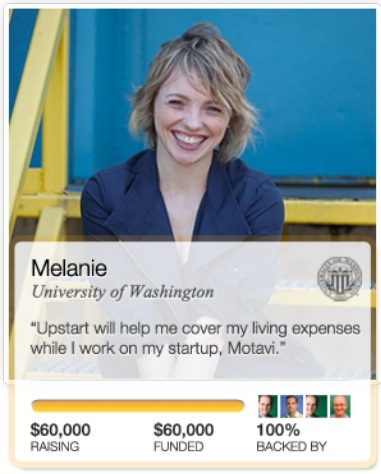 With Upstart, people can raise personal funding (the company’s website declares, “The startup is you“) in exchange for a share of their future earnings. After they sign up, students create a profile with their achievements and goals, verify their academic credentials, then identify how much money they want to raise. With that data, Upstart calculates how much of their income they’ll need to share with investors in order to raise that funding. (Girouard notes that some college graduates are going to be better bets to earn more money, so they’ll need to commit a smaller percentage of their income.) Then investors can commit to backing a graduate for an amount of their choice, in increments of $1,000. The payments are made on a monthly basis, and are verified based on annual tax returns. The maximum amount of your income that you can commit is 7 percent, and you don’t have to pay for years where you make less than $30,000. Girouard argues that this approach is particularly suited for the entrepreneurial lifestyle, where your income is likely to be “lumpy and inconsistent.” The payment size varies based on how much you’re making, so if you have a lean year, hopefully you don’t have to worry about how you’re going to be able to afford your payment. On the other hand, in the years when that hard work pays off in a big financial reward, your backers will benefit too. And if you become the next Mark Zuckerberg, that doesn’t mean you’re going to be writing insanely large checks to those investors — the payments are capped at a 14.99 percent annual return. It’s not just about the financial backing, either. The point is to connect students with people who will provide mentorship as well as money — indeed, they’ll be particularly motivated to provide that mentorship thanks to the financial incentive. (Girouard also suggests that as with many early Kickstarter projects, participants will raise a lot of the money from people they already know.) This emphasis on connecting students with mentors is, Girouard says, a big part of what sets Upstart apart from other “income-based repayment” efforts like Thrust Fund. Upstart should help fund a much broader range of efforts than just your run-of-the-mill tech startups. For example, Girouard notes that one of the schools participating in the pilot program is the Rhode Island School of Design, where graduates might want to start their own small design shops rather than going to work for someone else. Upstart funding will also be available at Arizona State University, Dartmouth College, University of Michigan, and University of Washington this fall. The company has raised a $1.75 million seed round of funding from Kleiner Perkins Caufield & Byers, NEA, Google Ventures, First Round Capital, Crunchfund, and Dallas Maverick’s owner Mark Cuban.